I am deeply honored to welcome you here this evening on behalf of H.E. Mamadou Haidara, Ambassador of Cote d’Ivoire to the United States, on the occasion of the Fundraising Gala initiated by DC Goal Coach. Allow me first to convey the heartfelt regrets of H.E. Mamadou Haïdara for not being able to welcome you in person due to unexpected sad event which brought him out of the city today. Let me recall that the Fundraising Gala we are attending this evening is an initiative of DC Goal Coach, an organization committed, among others, to bringing African Americans to the continent of Africa at least once in their lives. I particularly wish to commend Mrs. Gabrielle Holmes, CEO of DC Goal Coach. Mrs. Holmes is first and foremost a Coach, that is a person who deeply believes in the ability of man to tap into their internal creative resources to make it happen. It is indeed an absorbing task. Nonetheless, she has decided to make a major concern of the condition of people living in dire straits in Africa. 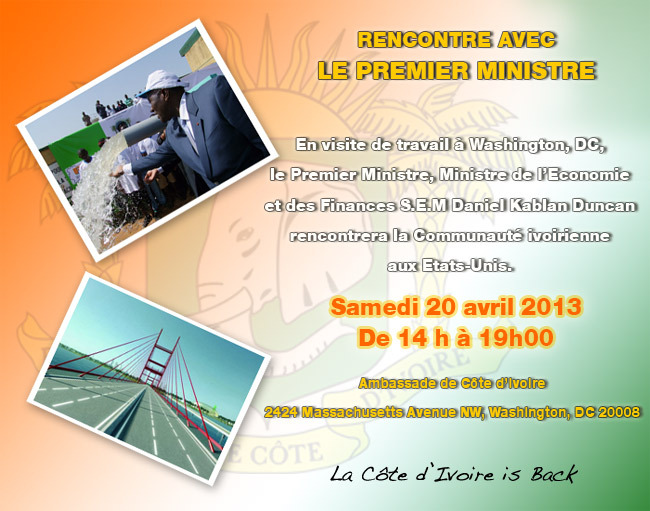 And for the launching of the Embassy Journey, another component of the organization’s program, she chose the Chancery of Cote d’Ivoire to host the first fundraiser for DC Goal Coach mission’s trip in Africa, and more specifically in Cote d’Ivoire. I would like to thank you on behalf of Ambassador Mamadou Haidara and let you know that we are honored to partner with you in this exciting journey. That said, I wish to pay tribute to the distinguished Guests gathered here this evening, who have a full understanding of the noble purpose of this Gala, and who have come to support it and make it a success. This gala is taking place because you have come. And I know for certain that you are all motivated this evening by a burning desire to grant smile to someone in Africa. That’s why on behalf of Ambassador Mamadou Haidara, I wish to extend a warm and heartfelt thank you to each and every one of you for taking the time to be with us. Thank you for your support and for granting this event a unique touch. I remain convinced that this excellent initiative you are starting today, whereby you seek to meet needs in Africa with voluntary financial contributions collected in this country by DC Goal Coach, will become someday a reference in this nation. I thank you for your kind attention and wish each and every one an excellent evening.